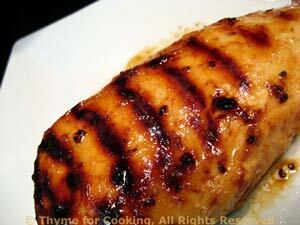 Grilled Chicken Breasts with a Golden Glaze, summer main course. When you are marinating any sort of meat it helps to poke a fork into it, then turn the meat several times to soak up the marinade. The orange marmalade and sherry give the chicken sweetness, while the ginger and garlic add some heat. In small bowl mix all ingredients for marinade. Put chicken breasts in shallow baking dish (or something with sides) and pour marinade over. Let marinate for 15 minutes. Cook on barbecue grill for 15 - 20 minutes or until done. Test by taking a peak - stick a knife in the center and see if it is still pink - if it is, cook another 5 minutes. Can also be baked in 400F oven for 20 - 25 minutes or until done - test.